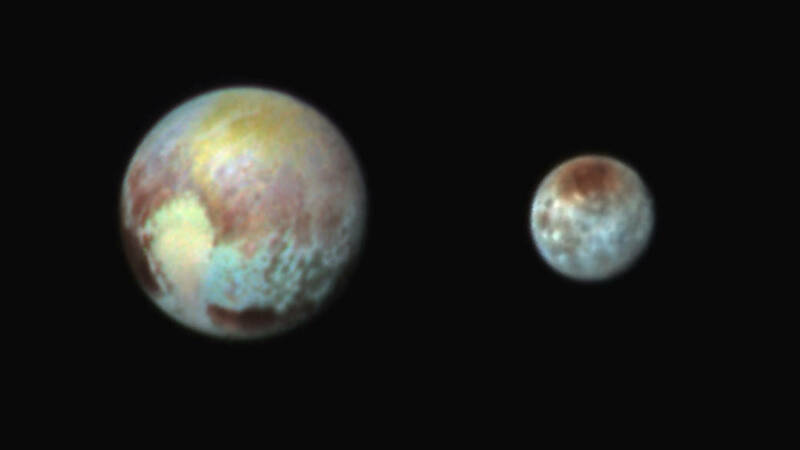 The image reveals that the bright heart-shaped region of Pluto includes areas that differ in color characteristics. The western lobe, shaped like an ice-cream cone, appears peach color in this image. A mottled area on the right (east) appears bluish. Even within Pluto's northern polar cap, in the upper part of the image, various shades of yellow-orange indicate subtle compositional differences. “We make these color images to highlight the variety of surface environments present in the Pluto system,” said Dennis Reuter, co-investigator with the New Horizons Composition Team. “They show us in an intuitive way that there is much still to learn from the data coming down.” Due to the three-billion-mile distance to Pluto, data takes 4 ½ hours to come to Earth, even at the speed of light. It will take 16 months for all of New Horizons’ science data to be received, and the treasure trove from this mission will be studied for decades to come. At 7:49 AM EDT on Tuesday, July 14 New Horizons sped past Pluto at 30,800 miles per hour (49,600 kilometers per hour), with a suite of seven science instruments. As planned, New Horizons went incommunicado as it hurtled through the Pluto-Charon system busily gathering data. The New Horizons team will breathe a sigh of relief when New Horizons “phones home” at approximately 9:02 p.m. EDT on July 14. The mission to the icy dwarf planet completes the initial reconnaissance of the solar system.